Like Gambia, Syria, Sri Lanka and Bosnia and Herzegovina, Mexico is a country whose government uses enforced disappearance to silence their critics and instil fear, reported Amnesty International (AI). On August 27, Salil Shetty, Secretary General of Amnesty International, presented a report to mark International Day of the Disappeared, which reveals that since 2007—i.e., during the administrations of Felipe Calderón [2006-2012] and Enrique Peña Nieto [2012- ]—almost 25,000 people have disappeared in Mexico. I am writing to express my deep concern about the human rights crisis that Mexico is going through. – Protocols and teams for ‘rapid search’ be established for all cases of disappeared persons. – Comprehensive law on enforced disappearance be adopted that would include the declaration of absence owing to disappearance. – Single register of disappeared persons be created. – Legislative measures be adopted to ensure that enforced disappearances committed by the military against civilians be investigated and tried by civilian authorities. – Investigations be thorough, exhaustive to the last line of investigation and facilitated by the participation of persons close to the victims. Also, I ask that you prevent and punish acts of intimidation and harassment against families of disappeared persons and against the organizations that support them. 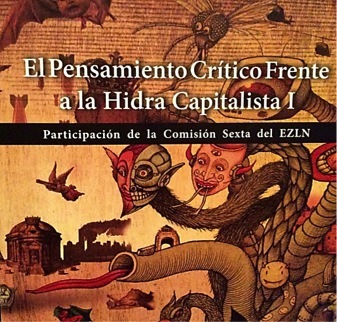 The book, which collects together the participation of the Sixth Committee of the EZLN in the seminar of the same name last May in San Cristobal de las Casas, will be presented both nationally and internationally, by collectives and individuals adherents to and supporters of the Sixth, and students from the Zapatista escuelita. Subcomandantes Moisés and Galeano also expressed their word in the text, explaining about the Resistance and Rebellion of the Zapatistas; their Political Economy; their view over the capitalist hydra; the coming storm; and words in memory of the Zapatista teacher Galeano and the Zapatista philosopher Luis Villoro Toranzo. 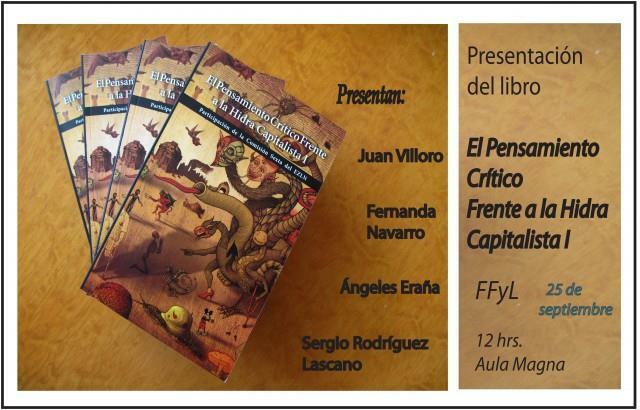 The presentations will take place next Tuesday 25th August at the Faculty of Philosophy and Letters of the UNAM and the ENAH in Mexico City; on the 27th in the Cideci Unitierra in San Cristobal de las Casas, Chiapas; on the 29th in the Tlanezi Calli Community Centre at Iztapalapa in Mexico City, and on the 30th in Escobedo Sur # 414, in the city of Monterrey, and on the 31st at the Faculty of Philosophy and Letters of the UANL, in the same city. “As Zapatistas, our first instinct is to ask questions, but now in the question, you can choose if you seek certainties or more doubts. Like a challenge, as soon as is met, can lead to another. As if the different explanations were the launch pad for further explanations,” they explained in the Rincon Zapatista Zacatecas and the cultural space “Viejo Antonio” last August 18th, reflecting on the text of the Chiapas rebels. Collectives and individuals have released the text in Colombia and Argentina; as well as Querétaro, Guadalajara and Puebla, according to the collective Pueblos en Camino. “And if, as is our Zapatista way, the end is also the beginning, we have to have more and better seedbeds; to make a place for practice, but also for self-reflection on this practice; understand the need for theory and the urgency for critical thinking,” point out the Zapatistas in the foreword to the text. “To look outside, we need to look inside. The consequences of what we see and how we see it, will be an important part of the answer to the question: what next?” add the indigenous Zapatistas of Chiapas. Hermosillo, Sonora – On Thursday night, Fernando Jiménez Gutiérrez, one of the Yaqui leaders opposed to the Independence Aqueduct, was released from the Social Rehabilitation Centre (CERESO) one in Hermosillo. Jiménez had been imprisoned almost a year. Greeted by members of the tribe and his family, Jiménez Gutiérrez said that during his captivity he was Governor Guillermo Padrés Elías’s political prisoner. 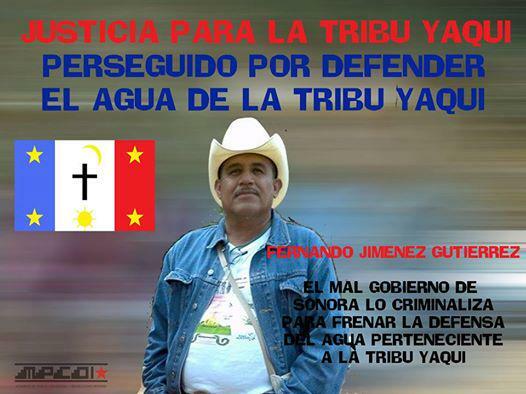 He said that he will continue fighting for the Yaquis’ right to water and for the release of his compañero Mario Luna Romero, who remains in CERESO. 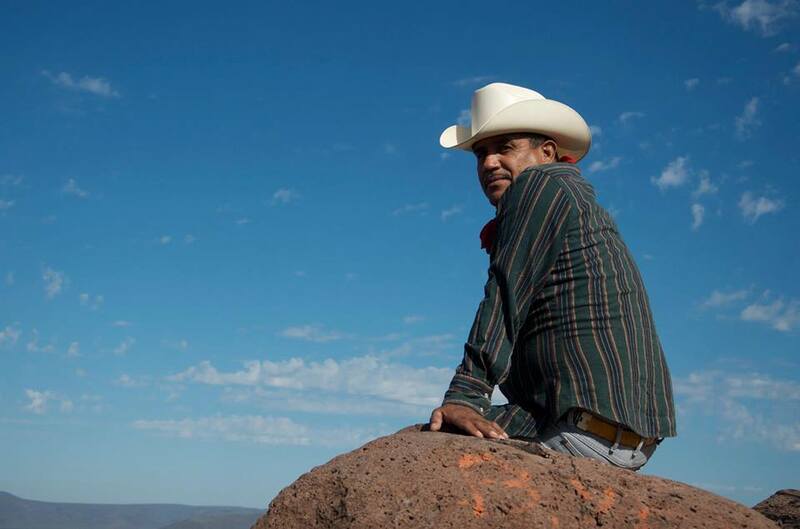 Jiménez pointed out that law enforcement authorities coming under the state governor accused him of robbery and kidnapping as a result of his participation, together with other members of the Yaqui Tribe, in the roadblocks at the Vícam community against the extraction of water from the Yaqui River, and its transfer 120 kilometres to the Sonora state capital, Hermosillo, via the Independence Aqueduct, built during the PAN administration of Governor Padrés. 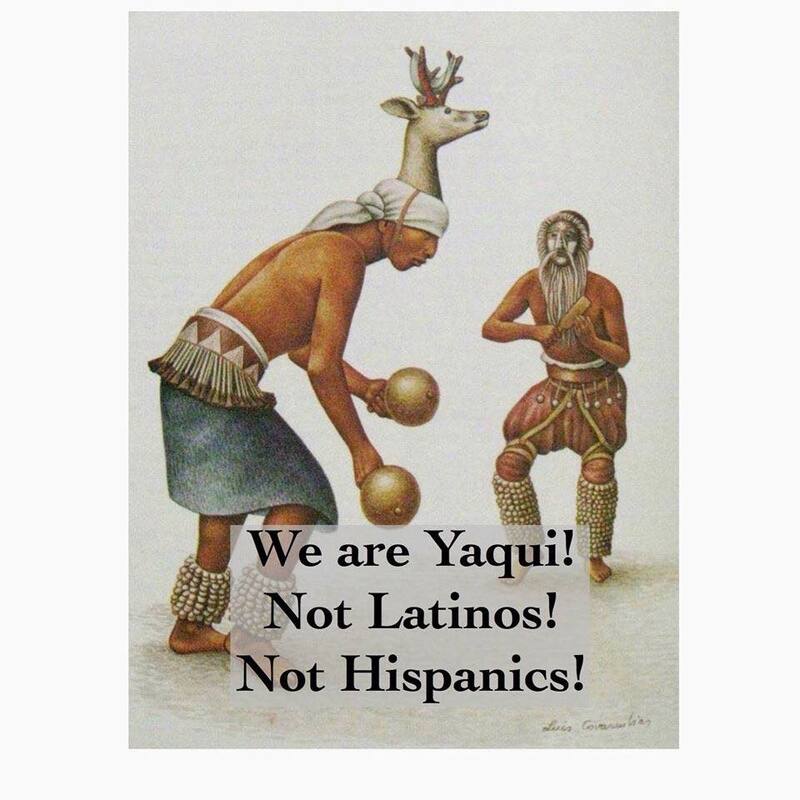 The Yaqui Tribe charges that the aqueduct deprives this Yaqui community of the water needed for agricultural use; thus, condemning the southern Sonora region to poverty and unemployment. “It is once again made clear that truth and justice will never, ever come from above. From above the only thing we can expect is pretence, deceit, impunity, and cynicism. 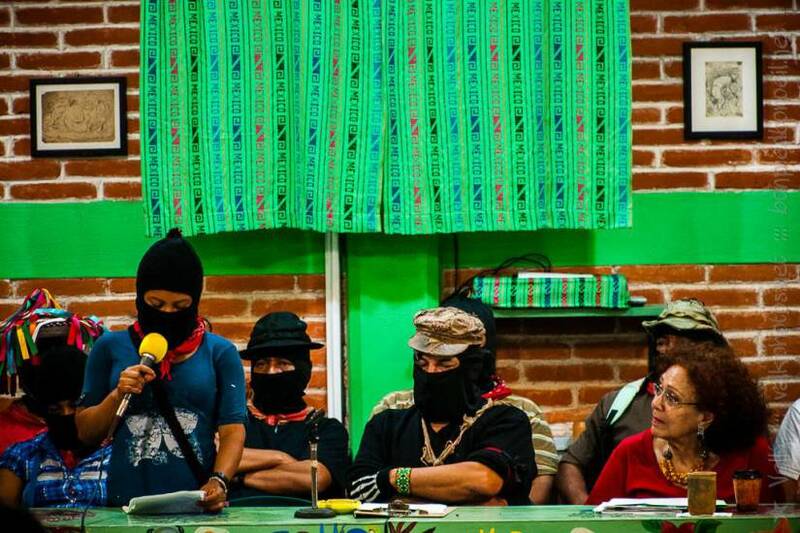 The Zapatista Army for National Liberation (EZLN) denounced in a communique signed by Subcomandante Insurgente Moisés and SCI Galeano (previously Marcos) on August 18th that the two people accused of the murder of the Zapatista teacher Galeano were freed. Galeano, José Luis Solís López, was murdered on May 2, 2014 en La Realidad, municipality of Las Margaritas, Chiapas. On August 3rd, the forcibly displaced families from the community of Banavil, municipality of Tenejapa, returned temporarily to work their lands for a period of 15 days “without a guarantee of minimum safety conditions from the Mexican State”, affirmed the Centre for Human Rights Fray Bartolomé de Las Casas. Before this temporary return, representatives of the displaced families made it clear in a press conference that they are returning “not because their denouncements are resolved, or because the authorities have offered full guarantee that the aggressions will not be repeated”, but because they want to work their land to be able to sustain their families. “Our temporary return is to check up on our houses, clean the adjoining properties of our parcels and it is a temporary return without justice”, they mentioned. From their part, the Human Rights Centre Fray Bartolomé de Las Casas denounced that “Since months ago the authorities told us they could return”, but it was not until the last meeting held with officials, hours before going to Banavil, when they were warned that there were no safety conditions. “Those were the exact words of Edgar Alonso, legal adviser of the authorities in Banavil, who were responsible for the attacks.” He told the government to say that there is no security, remarked the CDHFBC. On July 28th and 29th, a pilgrimage was carried out,organized by the pastoral staff, deacons and coordinators of the Tojolab’al Mission where close to 5,000 tojolab’ales, tseltales, tsotsiles and mestizos were brought together. 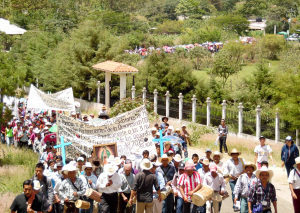 They expressed and showed their solidarity with the pueblo of Simojovel and denounced the forced displacement of people from Banavil and particularily drew attention to the case of the Poblado Primero de Agosto, where 57 people were forcibly displaced from their lands by members of the ejido Miguel Hidalgo, also members of the Independent Central of Agricultural Workers and Campesinos – Historic (CIOAC-H). The walk started from Ignacio Zaragoza, to the municipal capital of Las Margaritas, ending at the parish of San Sebastian in Comitan de Domínguez. “The gospel teaches us not to remain silent before cases such as Acteal; Simojovel, the forced displacement of Banavil and Primero de Agosto; before cases of the destruction of nature from mining and mega projects and in cases such as alcoholism and drug addiction in our communities,” shared Marcelo Perez Perez, pastor of Simojovel. From their part, the Network for Peace (Red por la Paz) Chiapas, demonstrated that the case of the displaced families of Primero de Agosto is not an isolated case, and at the same time reiterated their solidarity with them, “It is a privilege to pilgrim and walk with you. We will continue walking ts’omanotik (together)” they added. In a pronouncement, The Believing Peoples and the different communities and social organizations that participated in the pilgrimage, expressed that they are organizing, uniting, and transforming their consciousness, “to confront the violence that we live in our communities and the problems that come with structural reforms: such as education, health, labour, and energy”. 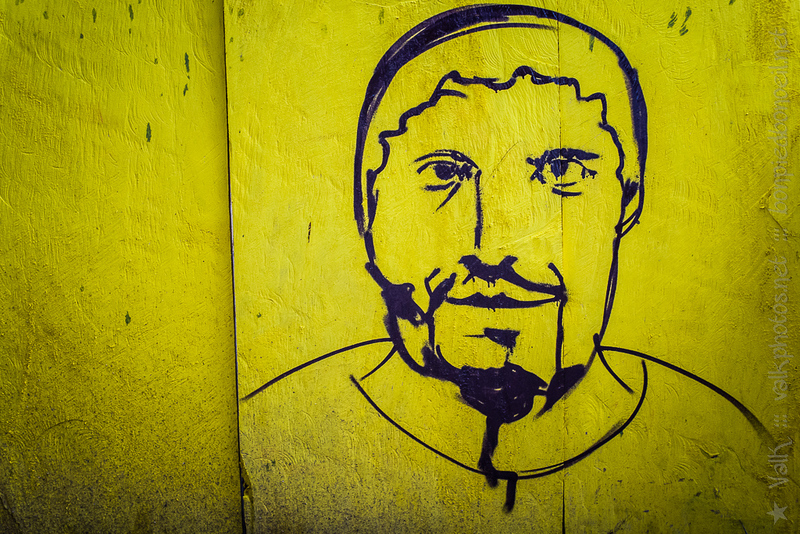 The Zapatistas recently responded to circulating false accusations that charge the peaceful revolutionary group with attempting to turn the public against electoral democracy, and even more specifically, against voting. The winding narrative exposes intersecting themes that, while sometimes contextualized in specific terms, can be decoded by stakeholders in every sphere as a deep-cutting critical analysis of modern electoral politics as a whole. The Zapatista critique is sharply objective in a fashion that only a truly outsider/out-group perspective oriented analysis can achieve. In their critical process, they diplomatically yet unapologetically challenge the assumptions and projections of the ‘institutionalized left’ while simultaneously decoding the oppressive and pervasive nature of the capitalist state. The critique systematically heists the veil from the crass sensationalism and sleight-of-hand seduction motifs that propel modern electoral campaigns. This false momentum, based on unsustainable levels of manufactured collective effervescence, is further destabilized by the tacit subtext that one can fulfil their political responsibility merely by choosing the right candidate. This quasi-consciousness unavoidably aggregates and assumes itself into the political identity of each candidate as each are forced to pretend that they can deliver more than is humanly, let alone politically, possible. Campaigns are valorised by hype and sound bites, not works and wisdom, while time and resources are continually co-opted from more honourable and productive pursuits. The political cycle becomes the means and the end; a careening race to sustain itself for the mere sake of sustaining itself. It is an existence that becomes almost devoid of larger purpose. The age old promise that this time things will be different–that this time things will be fair and ethical–remains so central to electoral campaigns because it almost never truly delivers. It’s the optimistic and dichotomous alternative to the manic street preacher promising that this time it really is the end of the world. A belief popularly espoused in the United States, that the political mainstreaming of third party candidates is the key to reviving this withering democracy, is demonstratively perforated in context as well. The Zapatista narrative illustrates that such fragmentation might even have the unintended consequence of inviting even more chaos into public and private life, creating more divisions and schisms in the process. However, their critique of the multi-party system in Mexico is by no means an endorsement of a two party system. The recent communiqué is not solely concerned with undermining the efforts of ‘partidistas’ (people who identify with a particular political party or its ideology), nor is it intended to directly challenge anyone’s opinions on representative democracy. By pointing out the trappings and failings of the system, they effectively demonstrate their central point, which is that voting will simply never be enough. The Zapatista message is that people must organize themselves outside of the institutionalized political process in order to satisfy their roles in the larger socio-political, and even geopolitical, landscapes. It is not enough to rally around the latest hero of the day and then sit idly by and wait for them to deliver – and then when they ultimately fail, to conjure and display seasoned disillusionment until the apparatus grows yet another newly packaged figure head. An oppressive and corrupt system is not likely to generate a savior that can effectively save the world from itself. One can navigate the system as one sees fit, but at the risk of oversimplifying, each must first save themselves in order to save the world. From the Zapatista view, the world is indeed in need of saving. In the grips of unsustainable capitalism -which they maintain oppresses every individual, from every walk of life – the world is conceived as being in the midst of a rapidly unfolding crisis. The Zapatistas are not issuing a final indictment of partidista politics, nor are they explicitly proselytizing their socio-political perspective. In fact, their take home point is that one’s ability to vote is simply not the sum total of one’s inherent political power, nor the full extent of one’s political responsibility. Reclaiming political and economic power, and thereby overcoming disenfranchisement from within the institutionalized system, is not going to be achieved simply by voting for your favourite candidate- but by all means vote for them. The guise is that one’s vote is enough. It’s not. In order to truly change the dynamics of, or achieve a new and lasting outcome within, the quasi-democratic electoral process, “…people have to learn for themselves that no one will solve their problems for them, but that instead we have to solve them ourselves…” If the Zapatistas have one overarching political strategy that they deem worthy of prescribing –be it in their carefully crafted non-paternalistic manner- it is to: organize, and then organize… and then organize some more after that. 28/07- Families from the village of Primero de Agosto remain in inhumane conditions and threatened by paramilitaries from CIOAC-H. The Digna Ochoa Human Rights Centre A.C. in Tonalá denounced “acts of harassment by members of the State Special (Ministerial) Police from the Procuraduría General de Justicia of the State of Chiapas, who presented themselves at the offices of this agency” on 01/07. “We invite all the individuals and peoples of our region, to reflect on the reality we live, to continue to make our voices heard, so that this gathering of peoples is only the beginning of our transformation of awareness, that all we join together with all our differences,” they concluded. In a statement, members of the network of agro-ecology supporters in 11 Chiapas municipalities working with the Union of Scientists Committed to Society (UCCS) pointed out that the court decision to lift the preventative measure that for the last two years has halted the process of authorizing planting permits for GM corn is an attack on the capacity of campesinos to manage their native corn in their local territories and in the country. 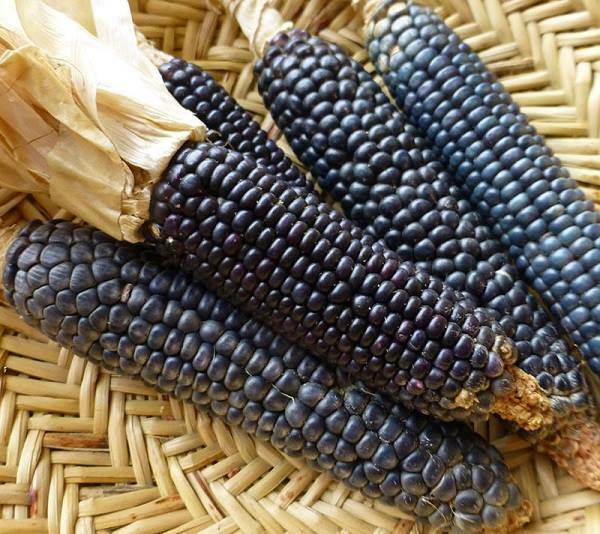 [Further,] they warned that Monsanto, Pioneer and Dupont already own 95 percent of [Mexico’s] native seeds, including corn, listed in the National Catalogue of Plant Varieties. In a statement, they pointed out that in overturning the precautionary measure, Judge Francisco Peñaloza, presiding over the Twelfth District Court for Civil Matters of the First Circuit, left out arguments presented by the UCCS that expose the health risks associated with industrialized and GM food. Although the judge lifted the injunction, planting of GM corn cannot take place because [as soon as Judge Peñaloza’s ruling was announced,] the Corn Collective that had filed the original class action lawsuit against GM corn in 2013, immediately filed an appeal, which still has to be resolved in court. Network members added that there is great interest among the transnational corporations driving the planting of genetically modified organisms (GMOs) in Mexico, because Monsanto expects GMOs to represent between 75 and 80 percent of its sales. 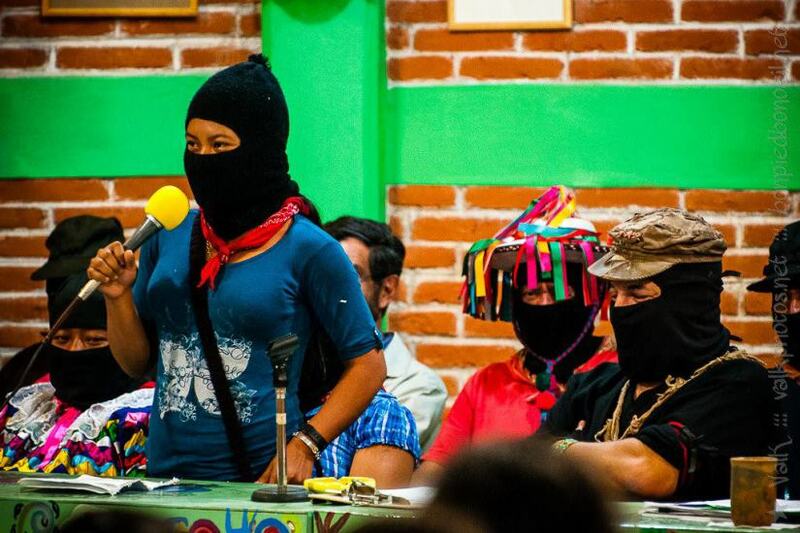 Impunity and Provoking the EZLN: Part of a Global Strategy? Once again we are given evidence that we live in times of uncompromising impunity. Justifiably outraged, the Zapatista leadership charged that it has no reason to trust the justice handed down by those from above. Unfortunately, it is a justice that includes neither impartiality nor objectivity. In the case of social sectors and movements outside the political and economic elites, it is a justice that systematically avoids the historical truth or manufactures it to suit itself, as in the Ayotzinapa investigation. In their August 16, 2015, communiqué, Subcomandantes Moisés and Galeano reported that: “Two of the intellectual authors of the murder of the compañero and teacher Galeano have returned, fat and happy, to their homes in the village of La Realidad. They were supposedly being held prisoner for the murder of our teacher and compañero. We already know that they have been declared innocent of this crime by the same people who financed and supported them: the federal and Chiapas state governments. Pedro Faro, director of Frayba, said that both Tojolabal indigenous men were presumably released on the grounds that: “witnesses retracted their testimonies, and that the Public Ministry prosecutor did not authenticate the body” of the teacher at the Zapatista escuelita. Faro asserted that there are also 10 arrest warrants against members of the CIOAC-H -charged with being involved in the events – that 15 months after they were issued have not been carried out (La Jornada, 22/08/2015). 3) At the very least, the state government of Chiapas is involved. Still to be determined, they said, is the extent to which the federal government is involved. As at Acteal, once again decisions taken under counter-insurgent logic are justified under the customary failures of due process. 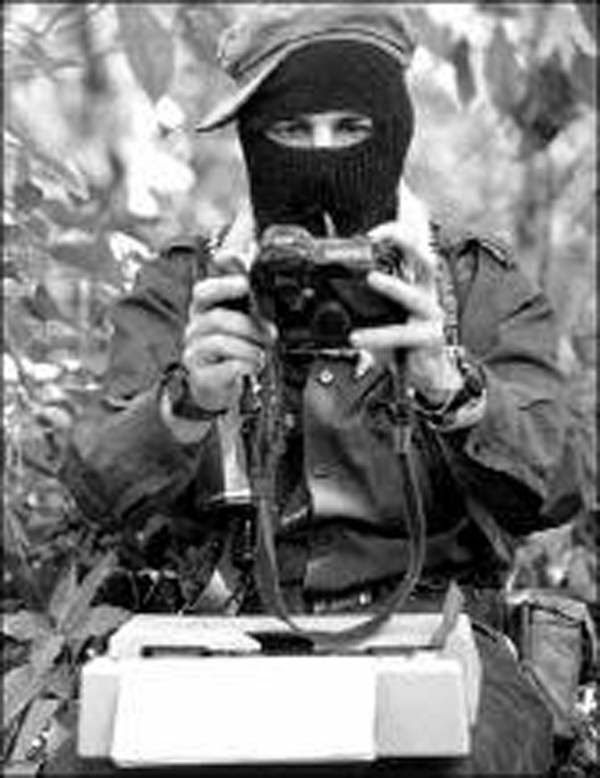 We cannot assume that it is about a decision taken apart from the political intention to provoke the EZLN; specifically, the Zapatista bases in the emblematic community of La Realidad. 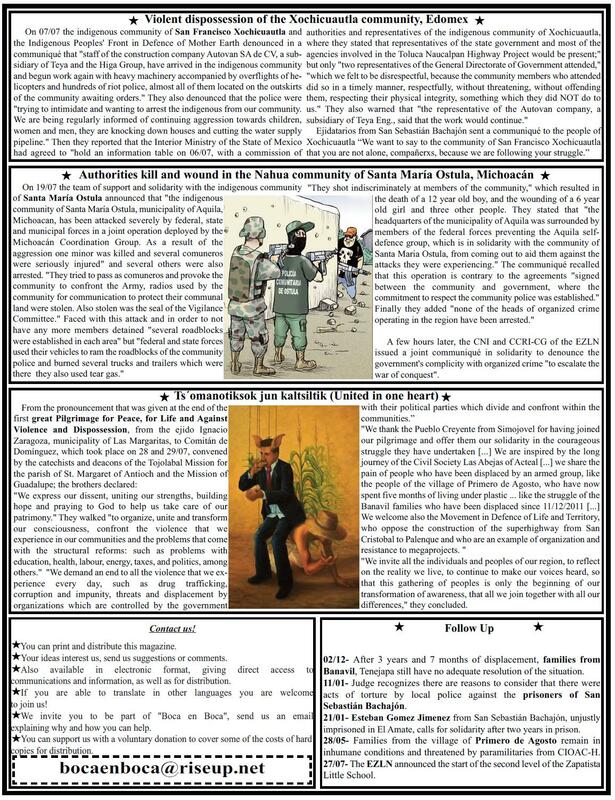 It would appear that they aim to inflame a local confrontation with paramilitary support to prevent coordination with other of the country’s resistance movements, such as the Yaqui, Xochicuautla, Ostula and Ayotzinapa and the democratic teachers, among many others that the subcomandantes named in their communiqué. 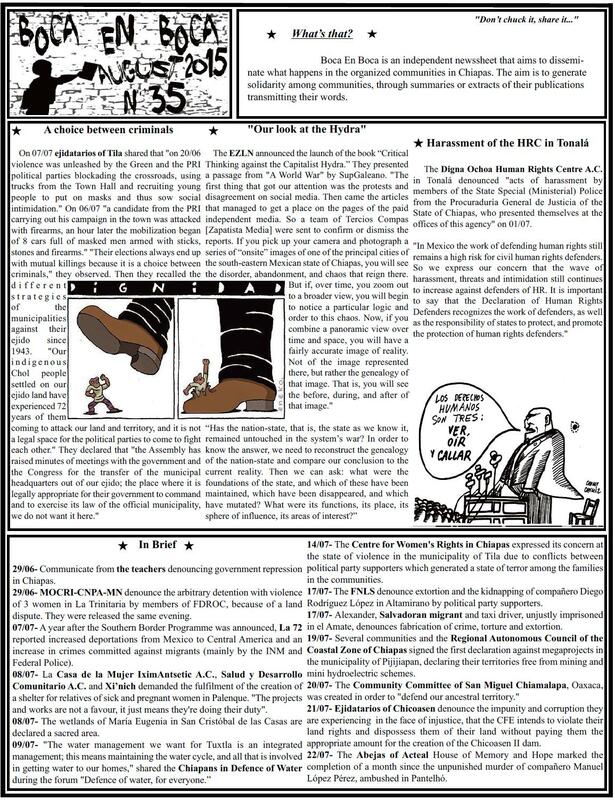 Nor is this scenario removed from the pending announcement of the project that Enrique Peña Nieto will send to Congress as an initiative for authorizing the Executive Branch to establish special economic zones in Oaxaca, Chiapas and Guerrero, under the argument of facilitating strategic transnational investment. According to Treasury Secretary: “in these states, the positive effects of the entry into force of the Free Trade Agreement [NAFTA], and Mexico’s entry into the global economy are not observed.” They add that welfarism and extreme poverty will be overcome. They are going for all the territories; their plan against the indigenous peoples is well underway. Send 15,000 Federal Police to Oaxaca to contain the protest in the teacher ranks. *Magdalena Gómez is a lawyer specializing in Agrarian Law, Indigenous Rights and Law, Political Education and Society. Juan Antonio Gómez Silvano, Mario Aguilar Silvano and Roberto Gómez Hernández, adherents to the Sixth Declaration of the Lacandón Jungle of the Zapatista Army of National Liberation (EZLN), were released on Tuesday 18th August from Cereso 12 in Yajalón, Chiapas, in compliance with amparo 1456/2014 in which it is recognized that their rights were violated when they were arrested. The three young Tseltales from Bachajón (none over 24 years old) were captured in the early morning of September 16, 2014. The same police officers who arrested the youths asserted that the youths attempted to murder them [the police], which was never proved. In the resolution of the amparo, of which Más de 131 obtained a copy, we read that the agents did not fulfil “their obligation” to put the detainees immediately under ministerial authority, as required by the law, but presented them 9 hours later. “Especially since the complainants argue that the Municipal Police of Chilon, Chiapas, inflicted acts of torture on them in order to incriminate them” says the text of the resolution issued in the First District Court of Coatzacoalcos, Veracruz. “It did not pass unnoticed by the undersigned that in the ministerial procedure of September 16, 2014, the investigating prosecutor gave evidence of the injuries to the physical integrity of the accused”. This reporter visited the three indigenous a few days after they were arrested. During a talk that lasted two hours, they gave their testimony in Tseltal. Their faces showed severe bumps and scrapes. As Más de 131 has documented on several occasions, the Tseltal indigenous adherents to the Sixth fear that, in the area around the waterfalls of Agua Azul, which are adjacent to their territory, a tourist resort complex is being set up which will gradually displace them. 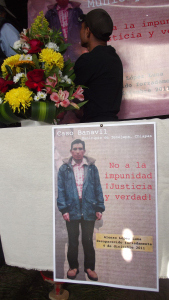 Since they began their struggle, the adherents to the Sixth have suffered the murders of two of their spokespeople: Juan Vázquez Guzmán (2012) and Juan Carlos Gómez Silvano (2013). The adherents still have three other prisoners: Esteban Gómez Jiménez, Santiago Moreno Pérez and Emilio Jiménez Gómez. 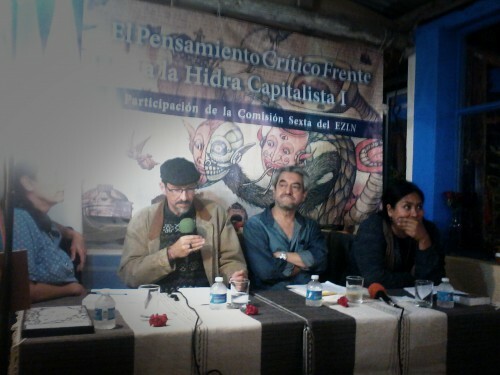 In the communiqué, the Tseltales also condemn the release of Carmelino Rodríguez Jiménez and Javier López Rodríguez, belonging to the CIOAC-H and imprisoned for the murder of the Zapatista votán José Luis Solís, “Galeano”, in 2014. Sylvia Marcos speaking at the seminar, with the Zapatista women, Selena and Sub Galeano. Photo courtesy of Jorge. San Cristobal de las Casas, Chiapas. 10 August 2015. We are in the Seedbed Seminar convoked by the EZLN few weeks ago. 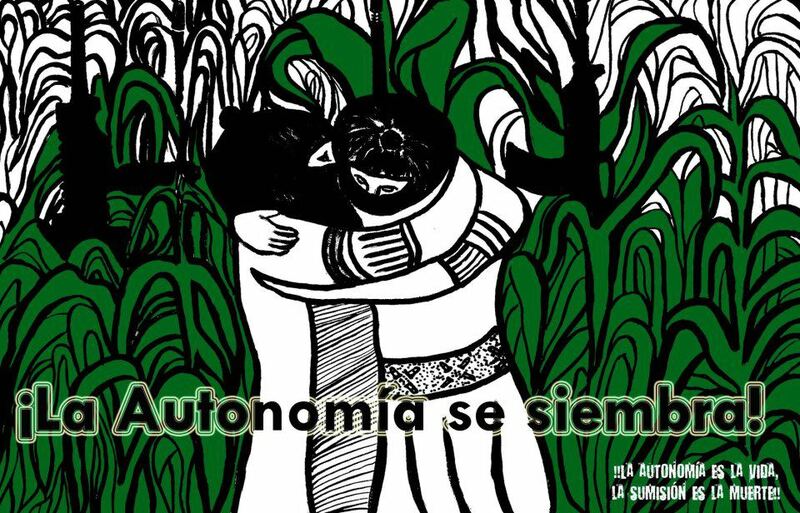 A young Zapatista woman, aged 17, explains how she understands autonomy, freedom and struggle. Her name is Selena. She speaks standing next to Subcomandante Galeano, with a smile that can be discerned through her balaclava and which shows the brightness of her mischievous eyes. We know that she is content and happy, and without a hint of shyness or shame at being in front of an entire auditorium full of intellectuals, university professors, her compañer@s in struggle, we feminists, and next to the Sub. Selena is, with Eloisa, Lizbeth and other women, one of those young Zapatistas who were born and grew up in autonomous education. She is now sitting at the end of a long row of Zapatista women, her elders, Comandantas Miriam, Rosalinda, Dalia … and another young woman, Lisbeth. Selena talks to us about her experience as a Zapatista teenager. Woman and girl. What do girls in that age group talk about these days? What are their concerns? Their hopes, their proposals? What do they expect in the immediate future? It seems that this banality is the common denominator of the young people of this age. For example, if we go on the Internet, we find portraits of girls from Mayan communities who look all decked out in “dressmaker” clothing, modernized skirts and blouses based on their traditional blouses (huipiles) and petticoats, as Selena ironically observed during the seedbed. Will these be the ambitions of girls aged 17-18, today? Selena, like all the compañeras, carries a piece of paper with notes written with a ballpoint pen, of the kind that runs in the wash and stains. She squeezes the papers while looking at them sideways, to remember what she has prepared to say tonight. 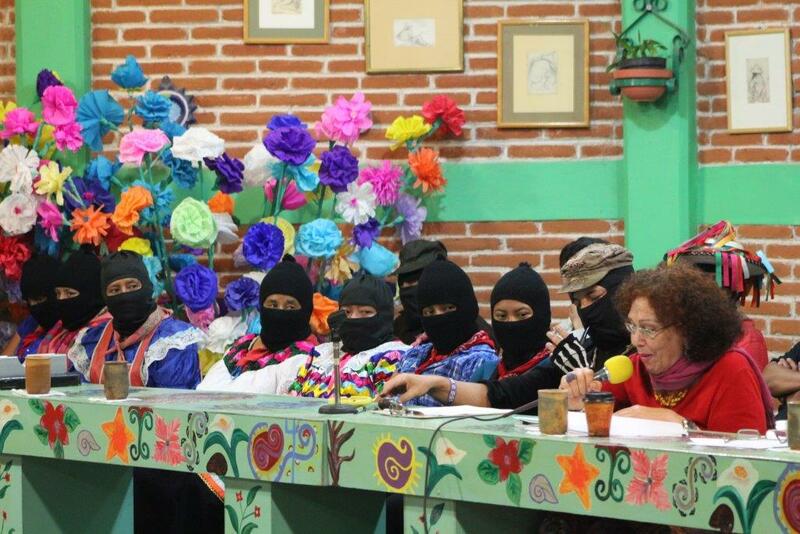 That took place during the great session specifically devoted to women at the seminar-seedbed convened by the EZLN, and held in CIDECI last May. In this session those of us who were speaking included a Kurdish woman, a Latina immigrant in the United States, the Italian historian Silvia Federici, whose speech was read in her absence; as well as six Zapatistas, there were also we three feminists: Mariana Favela, Margara Millán and Sylvia Marcos. This whole world in a session that lasted 5 hours. As for Selena, she had to talk near the end, just before Sub Galeano. I feel close to all of them. My notes also come creased, edited and rewritten over. The original is on a computer, but it is very old and sometimes does not do what I ask, it gets stuck and blocks and will no longer process. For example, I typed dicotómico [dichotomous] and it “corrected” me to totémico [totemic]. Yes, she is an old lady … .but I like her because she is not a super tablet, which would force me to un-think, to write fast and to learn so many new clicks that it would reduce the time I have available for reflection. It is the covert low intensity war, installed in the intricacies of interpersonal coexistence. Reproduced and magnified by the media, television and novels, advertising and even sports. Selena’s critical mind reveals this hidden war and brings it in to everyday existence, to daily life. In the lucid thinking of this young woman, the battle also has to take place here in the everyday, in what seems innocent, harmless, in what is not necessarily manifested as the brute force or even murder which is frequently suffered in the communities. The low intensity war is not only registered through extreme violence. It is also waged within subjectivity, to imbue the youth with consumptions and values ​​that distract them, alienate them, dominate them mentally and emotionally. Selena discovers this, analyses it, and sees it clearly. A little later, Selena reflects aloud. She remembers her compas as they return after work outside Zapatista territory and sometimes abroad. She says they are very conceited, as if they think a lot of themselves, and feel superior to those who stayed at home. They think they are rich because now they have their latest model cell phone, their smart phone, or i-phone, their leather boots, their city shoes. Luxury goods make them believe that, after what they have done, they are now more important. Selena looks thoughtful but speaks sharply about those young people who go out of Zapatista territory and then return with these ways of acting, of perceiving themselves, of thinking, of consuming, of behaving. These people, Selena says, “not only continue to be poor, but now are poor-poor.” The word is expressive: they behave as if they are rich, but they have lost something and, therefore, are poorer than before. Selena, with her keen perception, borders on philosophy. There are thinkers who say that destitution arrives destroying poverty and there are philosophers who agree. Conversely, conscious poverty can be a form of power, it can come to present aspects of abundance. This young Zapatista echoes those reflections. Poverty is not a fault or a failure, nor necessarily a condition to be escaped. Poverty and frugality were the ideals of many fighters, thinkers, writers and saints. Not only in the Catholic or Christian tradition, but in many spiritual traditions: Hindu, Buddhist, Zoroastrian. It is also true that the experience of poverty, by the limits it imposes, protects nature from capitalist economic predation and greed. Many revolutionaries have chosen poverty as a path. The reality of so many people dying of hunger in some parts of the world while in other countries food is being wasted and destroyed is an obscene and intolerable fact to which we have, unfortunately, agreed to be anaesthetized. 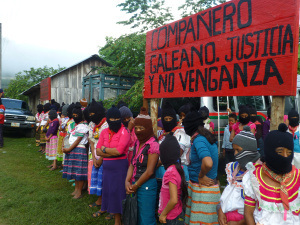 But within Zapatismo the values ​​go against the infamous capitalist consumption. 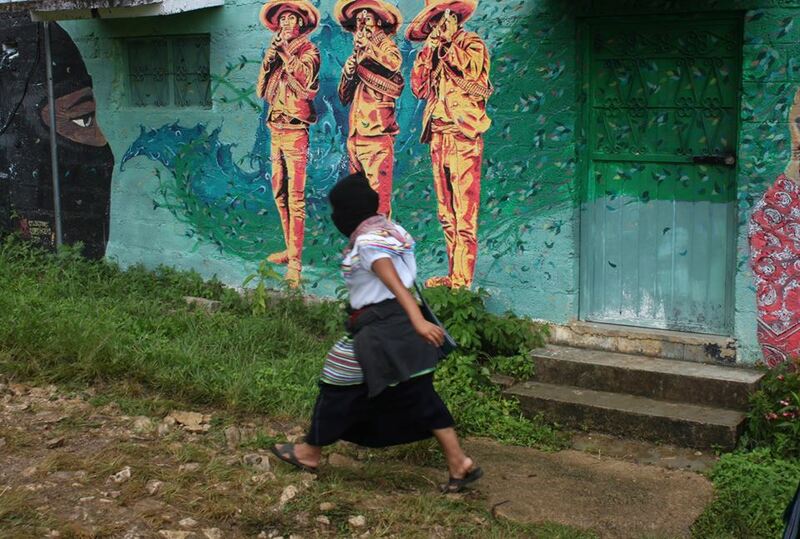 For this reason this young Zapatista woman has managed to escape the consumerist temptations of her age and gender. Not only does she not yield to these pressures, but she can also see them from the outside. She watches her compas who return, she sees how they act, she assesses them, confronts them and wants to correct them. “We work in full consciousness,” a compañera told us in La Garrucha. “Why do we say they are poor-poor? Because they are poor like us; but they are also poor thinkers because they leave their communities and when they come back they bring bad ideas with them, other ways of living.” “We Zapatistas are poor, but rich in thinking…..we don’t change our thinking or our way of life.” We have the wealth of our traditions and customs, Selena tells us. “We are ‘poor-rich. '” Some synonyms surround ​​Selena’s idea: rich can mean: abundant, valuable, lush, excellent. But these, believing they are returning rich, are only poor-poor. On August 19, 2015, Judge Francisco Peñaloza Heras, presiding over the Twelfth District Court for Civil Matters, cancelled the precautionary measure [injunction] suspending the planting of transgenic corn in Mexico. The injunction was issued two years ago in response to a class action lawsuit for the damages these grains cause to biodiversity and health. However, the suspension remains in force, since the judge’s decision was immediately appealed by Collectivas AC, the legal representatives of the group of 53 people and 20 organizations that filed the class action suit in 2013. The way Judge Peñaloza made the decision—ignoring arguments made by the plaintiffs and independent scientists, but basing it on the sayings of Monsanto and other companies—is another step in the dirty war against campesino corn and the peoples of the corn. Monsanto’s lies are not limited to legal aspects of the lawsuit. They devote significant time and resources to falsifying data in order to hide what’s really happening with GMOs in countries where planting is massive, like the United States, the country where Monsanto is headquartered. Based on almost two decades of official statistics (not specific studies funded by enterprises that take partial data) in the country, the reality shows that GMOs are more expensive than existing hybrids, that GMO crop yields are lower on average, and that GMOs have resulted in an exponential increase in the use of pesticides, with devastating effects on soil, water, and the emergence of more than 20 glyphosate-resistant “superweeds”. The industry claims that corn engineered with Bt toxin [Bacillus thuringiensis] decreased the use of pesticides, but fails to explain either that pests have been becoming resistant to Bt or that after an initial decline, pesticide use has increased every year. Therefore, companies are abandoning the sale of Bt corn seeds in order to sell GM corn seeds with stacked traits; that is, with Bt, tolerant to one or more highly toxic herbicides such as glyphosate, glufosinate, dicamba and even 2.4-d, thereby dramatically increasing the use of toxins. Companies also claim that GM corn can “coexist” with native corn. But many scientific studies and statistics in many countries demonstrate the opposite: where GM crops are cultivated, there will always be contamination, whether by pollen carried on the wind or by insects (at much greater distances than those “anticipated” by the laws) or by the activities of transporting, storing or selling in retail outlets where GM products are not segregated from other seeds. Many studies conducted in Mexico, including those carried out by Semarnat [Secretariat for the Environment and Natural Resources] itself, show hundreds of cases of GM contamination of native corn—even when planting GM corn is illegal. Legalizing the planting would brutally increase the contamination that directly threatens biodiversity and Mexico’s most important agricultural genetic heritage, bequeathed by the millions of campesino and indigenous peoples who created it and continue to maintain it. In the United States, contamination from GMOs is pervasive. Monsanto made it a business: suing victims of genetic contamination for using their patented genes, which has yielded the company hundreds of millions of dollars in judgments or out of court settlements. Monsanto recently declared that it is not going to sue farmers in Mexico. It would be absurd to believe it. Of course they will, when they have the right conditions. Since 2004, Monsanto has already published notices in newspapers in Chiapas warning that anyone engaged in the “illegal” use of their patented genes in “importing, planting, cultivating, selling or exporting” could suffer imprisonment and incur major fines. They also warned that anyone who is “familiar with any irregular situation” must contact Monsanto in order to avoid being accused of complicity. If someone didn’t follow through because he had no legal framework for doing so, one fears that now they [Monsanto] are exerting pressure to correct the situation. The transnationals lie when they claim that GMOs are harmless to health. For starters, GM crops have a level of glyphosate—the herbicide declared carcinogenic by the World Health Organisation in March 2015—up to 200 times higher [than native corn]. Almost every month, new articles are published with evidence of damage to health or the environment from GMOs. For example, on July 14, 2015, the peer-reviewed journal Agricultural Sciences published Dr. Shiva Ayyadurai’s research, which shows that GM soybean stores formaldehyde, a carcinogen, with a drastic decrease of glutathione, an antioxidant essential for cellular detoxification. The study analysed 6,497 experiments from 184 scientific institutions in 23 countries. The study lays bare the invalidity of the principle of “substantial equivalence” applied to assess GMOs—falsely claiming that [GMOs] are “equivalent” to conventional organisms. 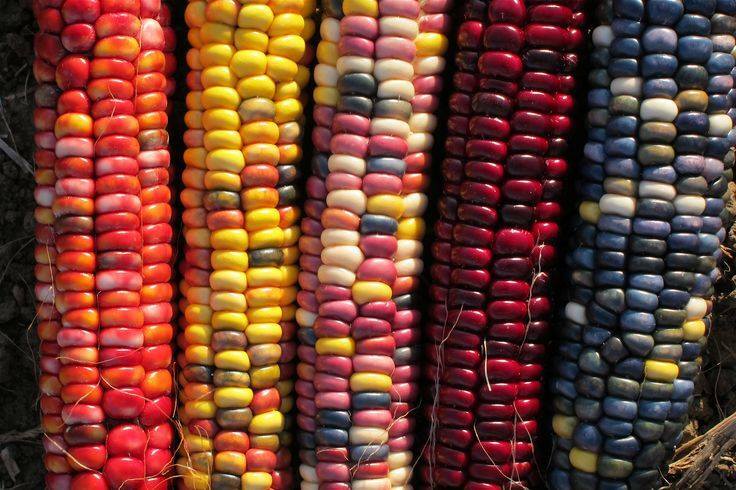 There is little knowledge of how GMOs affect corn biology and what impact GMOs have on biodiversity and the health of Mexico’s populace, who consume more corn than the people in any other country. The war intensifies, but so does the resistance, like the “popular moratorium” against allowing GMOs in our fields and tables. And that’s not going to end. *Silvia Ribeiro is Latin America Director for ETC (Action Group on Erosion, Technology and Concentration), which is dedicated to the conservation and sustainable advancement of cultural and ecological diversity and human rights. Ribeiro is based in Mexico.